The current and future generations of wireless networks, 5G and beyond, will have profound technological and economic impacts on our society. These wireless technologies are expected to radically reshape many existing applications and create numerous new opportunities. There are yet countless challenges lying ahead, many of which are happening at the “Physical Layer”, due to several fundamental limitations imposed by the nature of electromagnetics or device physics and practical constraints from economics, engineering, technologies, and application considerations. Consequently, significant research is required to bring 5G communications to reality. The IEEE IMC-5G 2019 conference provides a focused forum to bring together researchers and practitioners from different backgrounds to share the most recent advances in hardware and system technologies for 5G and beyond. IMC-5G 2019 will feature a two-day archival series of oral and poster presentations with invited talks and tutorials. An industrial exhibit featuring a selection of state-of-the-art wireless and microwave products, measurement instruments and CAD software tools will also be held. The participation of young researchers and postgraduate students is strongly encouraged. Best Student Papers and Young Researcher Travel Grants are available. Atlanta is the capital and the largest city in the U.S. state of Georgia. 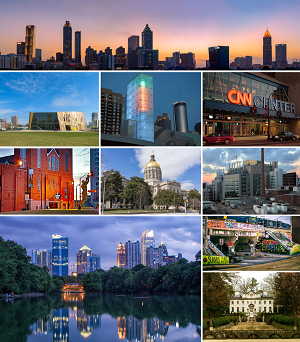 The city serves as the cultural and economic center of the Atlanta metropolitan area, home to 5.8 million people and the ninth-largest metropolitan area in the nation. Atlanta has unique topographic features that include rolling hills and dense tree coverage, earning it the nickname of "the city in a forest." In December 2018, Atlanta was among the one of the first dozen US cities that were connected with AT&T 5G networks. Sprint’s “bridge to 5G”, Massive MIMO based technology, was deployed in Atlanta during the Super Bowl in Feburary 2019. Submitted papers should be three pages in length. Accepted contributions will be published in the workshop proceedings and will be archived in IEEE Xplore.